The W1 Connector launcher family includes both male and female W1 Connectors. 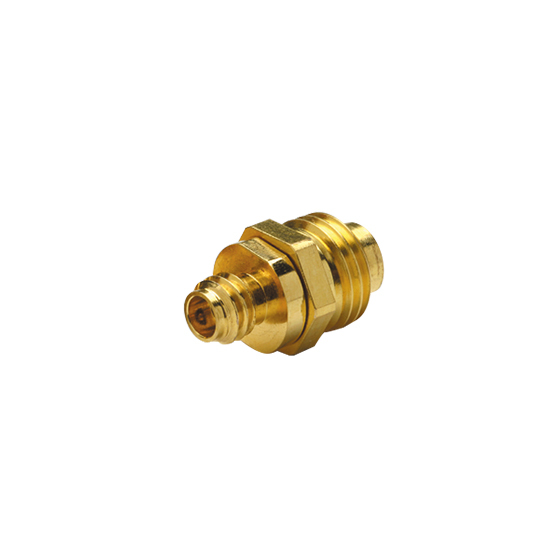 The W1 Connector has an air dielectric interface similar to K and V connectors. The center conductor is supported by Anritsu's proprietary low-loss high-temperature support bead on one end and by a glass bead on the other end. The center conductor of the glass bead extends out of the connector backside and allows the user to make a direct pin overlap connection to the Microwave Circuit. The threads on the backside of the W1 Connector allow the user to install the W1 Connector by screwing it into the housing wall. Because Anritsu's proprietary low-loss high-temperature plastic bead is used, the user can solder the connector into the housing to achieve an hermetic connection. For details, please refer to the W1 Connector Installation procedures. Integrating the glass bead into the connector allows Anritsu to control the critical matching steps of the interface between the bead pin and the center conductor and bead pin to Microstrip or Coplanar Waveguide (CPW).